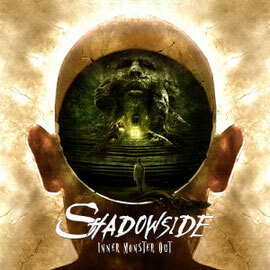 Brazilian metal band SHADOWSIDE has signed with Inner Wound Records and the album "INNER MONSTER OUT" is set for the worldwide release on May 11th in Europe and 22nd in the USA. In Japan it has already been released on March 14th from Spiritual Beast. They have already had many experiences for the tour as a support band and guest band, across the world. In early 2011, the band supported Iron Maiden in Rio de Janeiro, Brazil. Album "INNER MONSTER OUT" was produced, mixed and mastered by Fredrik Nordström in Gothenburg, Sweden, and features guest vocalists Mikael Stanne (Dark Tranquillity), Björn "Speed" Strid (Soilwork) and Niklas Isfeldt (Dream Evil) on the title-track.